There's something great about this little blogosphere of ours; getting to know new people who have similar interests to you but who may live miles and miles away. 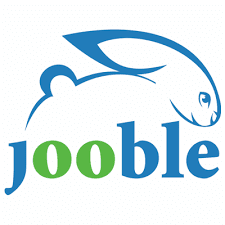 It's a source of comfort, support, fun, inspiration... and a great community to be a part of. 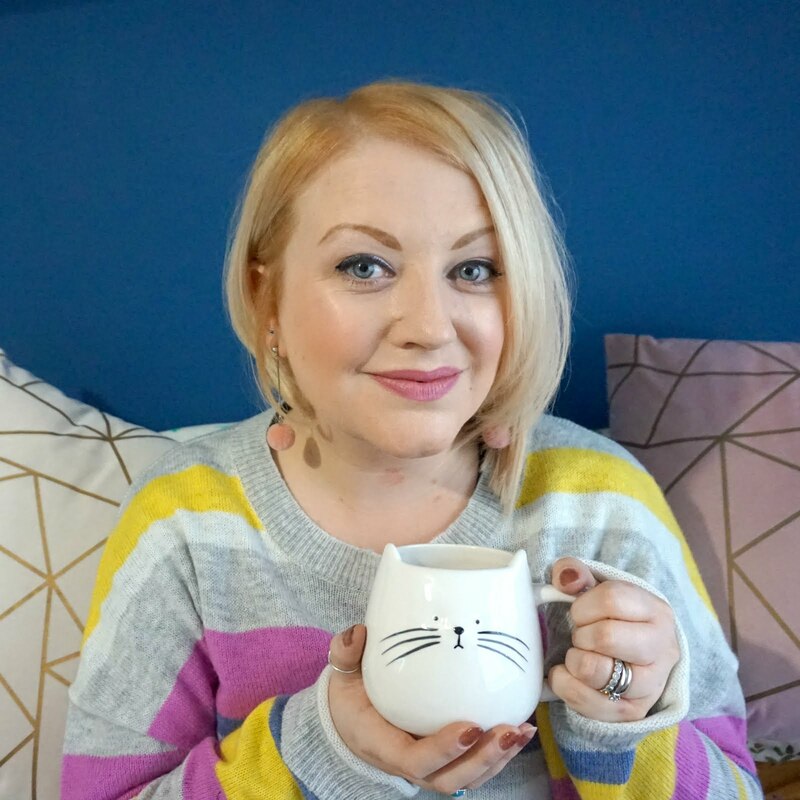 But sometimes, it's nice to meet people face to face, and because of this, the rather inspiring Emma from Frugally Peachy and I decided to organise a meet up of like minded bloggers. 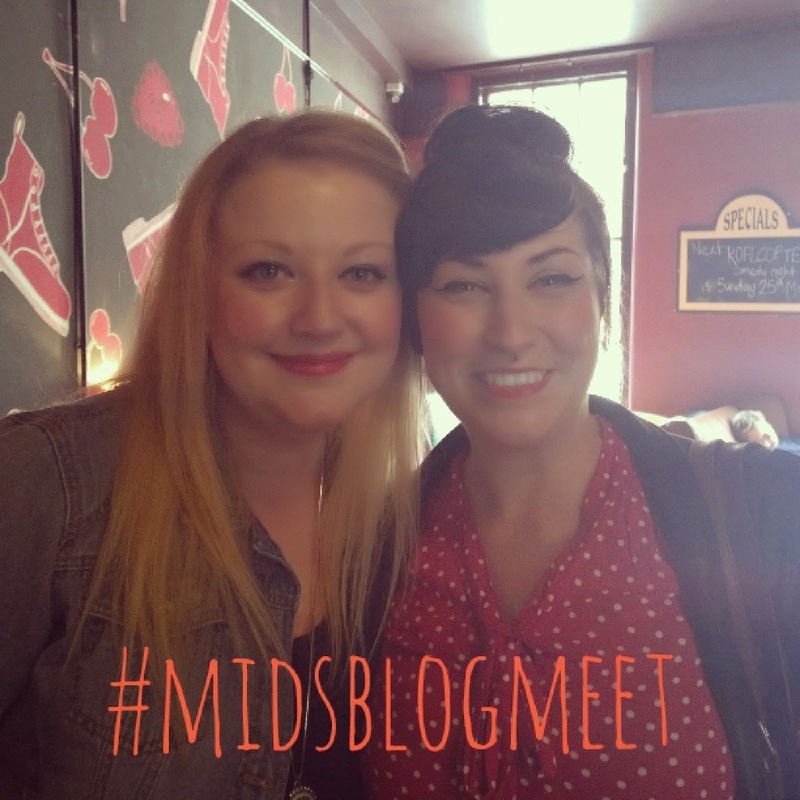 You may remember we organised the first #midsblogmeet back in February (read all about it here), and, bitten by the blogger meet up bug, we were keen to arrange another one as it was so nice to meet the people behind the blogs we read each day. 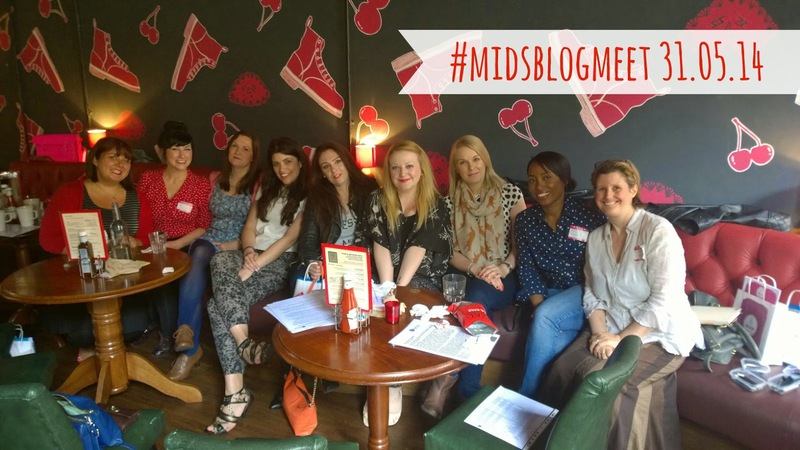 So, #midsblogmeet was born! 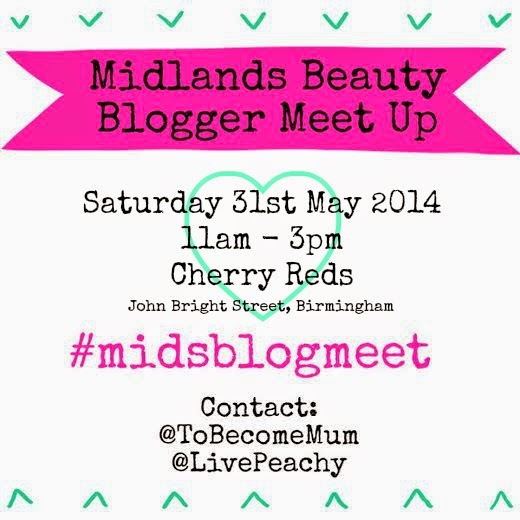 We decided to have a bit if a beauty theme this time around, just to help give a focus to the event, and we chose to host the meet up at Cherry Reds in Birmingham City Centre, for a change of scenery and so people could enjoy the shopping delights that this fair city I now call home has to offer. 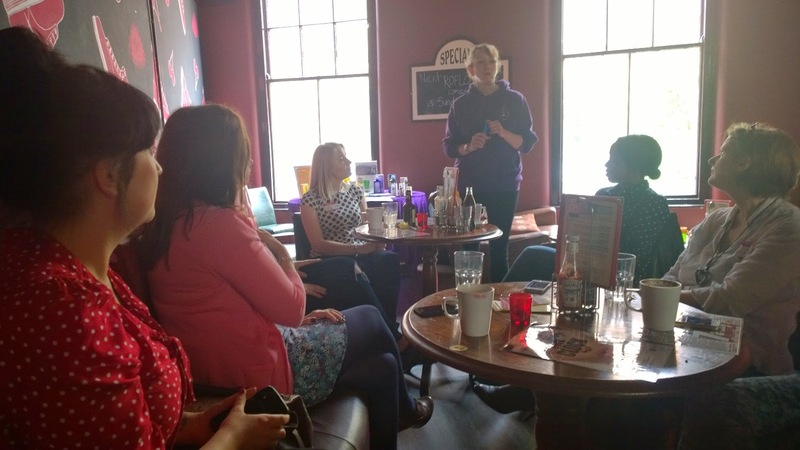 Nine lovely ladies descended on Birmingham on Saturday to talk about all things beautiful and it was a relaxed day with plenty of chatter, food and most importantly, products! 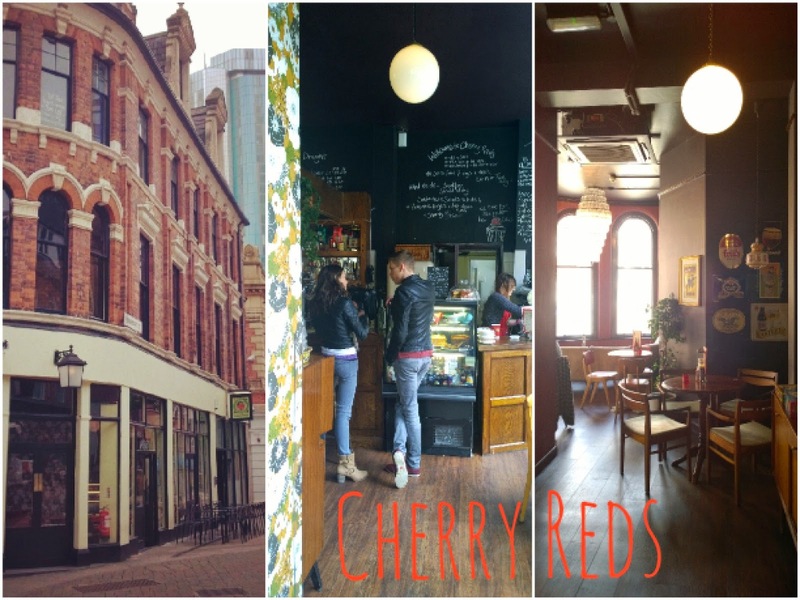 Cherry Reds is a fantastic, quirky café and bar nestled just around the corner from New Street Station, although Google maps enjoyed taking our attendees on a scenic route to find it! 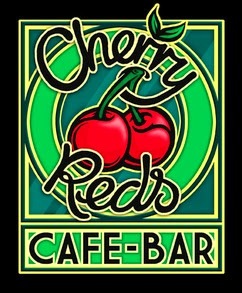 With a retro vibe and filled with mismatched quirky furniture and nic naks, Cherry Reds has a great range of drinks and freshly prepared food, served by a friendly team who were extremely accommodating to us. We were given their big sneaker themed function room upstairs for the day and everyone spent some time getting to know one each other. We talked about our blogs, what beauty products we liked and had been trying recently and even had a bit of a debate about the youth of today having a thing for designer brands when we were happy enough to settle for Natural Collection and 3 for £5 offers back in the day. Oh, and the days of hair mascara and Heather Shimmer lipstick! From the first event, we knew how well a guest visit went down at the meet up so this time, we decided to have not one but two guest speakers to talk about all things beauty. First up was the lovely Jo from Weleda. I have been an advocate for Weleda for the past year, having discovered their baby products first. 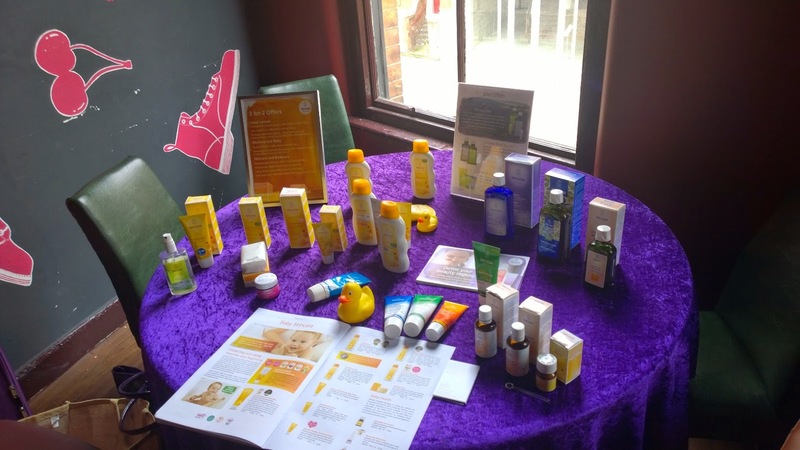 Their Calendula body lotion and face creams are particular favourites of mine - they are great for baby but for us mamas too, just ask Jessica Alba - and everyone got the chance to try some of these products whilst Jo explained what they contained and how they could be used. Weleda is almost 100 years old and uses all natural ingredients, and the main thing I took away from the meet up was something Jo said: 'what you put on you, you put in you.' Simple but it really struck a chord for us and this ended up being a theme of the day as we considered what we were putting on our skin and the effect that this could have. One fantastic factoid for you is how Weleda can trace any seed they pick right through to the product they use it in - that's just how much care goes into making each and every lotion and potion. Jo talked us through the different ranges with the various active natural ingredients, tailored to the four stages of your skin's development, and we sniffed and dabbed everything from Lavender Bath Milk to Sea Buckthorn Hand Cream to their amazing Skin Food cream (loved by Victoria Beckham) and even salt toothpaste. That's right, salt toothpaste! It sounds weird and it was an acquired taste but it has lots of benefits to offer, particularly if you're interested in overhauling your whole regime to be more natural from start to finish. To drop the name of another celeb who's a Weleda fan, Simon Cowell (clang!) recently said that the Citrus Refreshing Bath Milk was his number one product - I bet he bathes in a whole bath full of it! 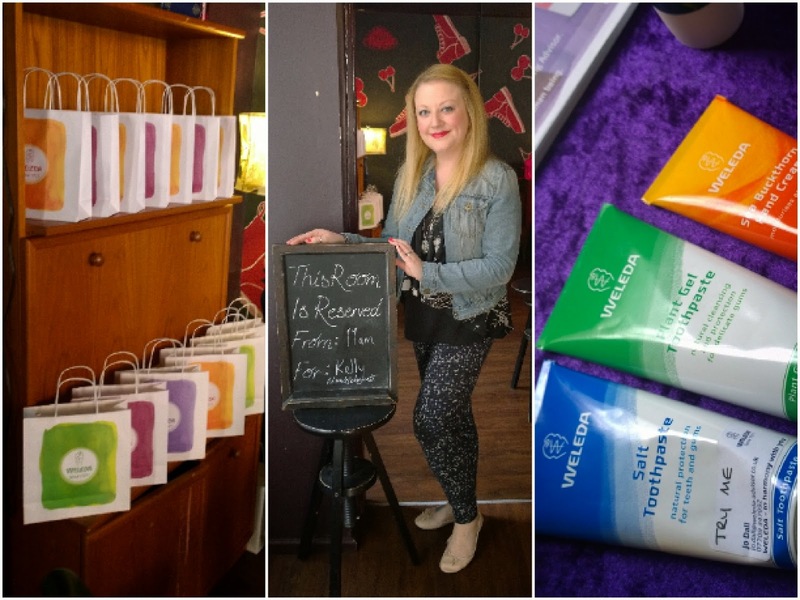 Weleda kindly provided goody bags for everyone with samples of the Calendula Body Cream and Pomogranate Firming Cream inside and Jo gave us all a brochure so we could browse the product ranges in more detail at our leisure. I have tried a sample of Skin Food and I really am amazed at how instantly effective it is for sorting out dry skin - rough elbows, be gone! We then had a break for lunch, followed by more chat and more food. 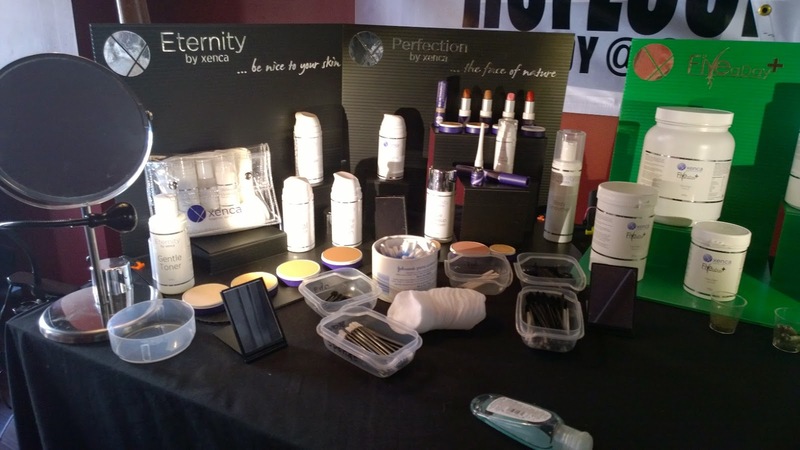 There was a real buzz and everyone seemed to enjoy sharing their beauty finds and learning more about natural products. It was then the turn of our second guest speaker - the vibrant Suzie from Xenca - a relatively new company, established two years ago, which is also focused on all things natural. Their Eternity skincare and Perfection make up ranges are all completely organic but they also have a collection of supplements called Revitalise. Suzie gave us some company background and explained the reasons why organic skincare is such a good, almost obvious, choice. The average woman puts 515 different chemicals on her skin every day - a scary figure which made us all feel a bit uneasy to hear! The products from Xenca use only natural, skin-friendly ingredients to gently cleanse and hydrate, and the make up range is non-pore clogging so you could sleep in your make up and your skin would still be able to breathe (although this is still not recommended!). Nabbed this pic from Sarah - thank you! 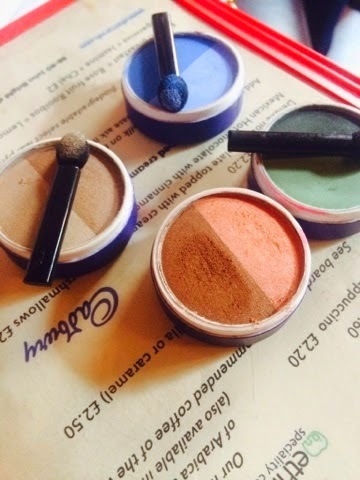 We got the chance to try the products for ourselves and we were then given the choice of a lipstick or eyeshadow to take away - cue lots of hand swatches and difficult choices being made! Suzie then introduced us to the Five A Day supplement, which is packed full of great things to help give you a daily vitamin boost, and we all tried some diluted in orange juice and couldn't really taste much difference at all. At the moment, I'm really interested in juicing and natural supplements, so quickly added this to my shopping list. We then found out about their Collagen supplements, which are reported to do amazing things. 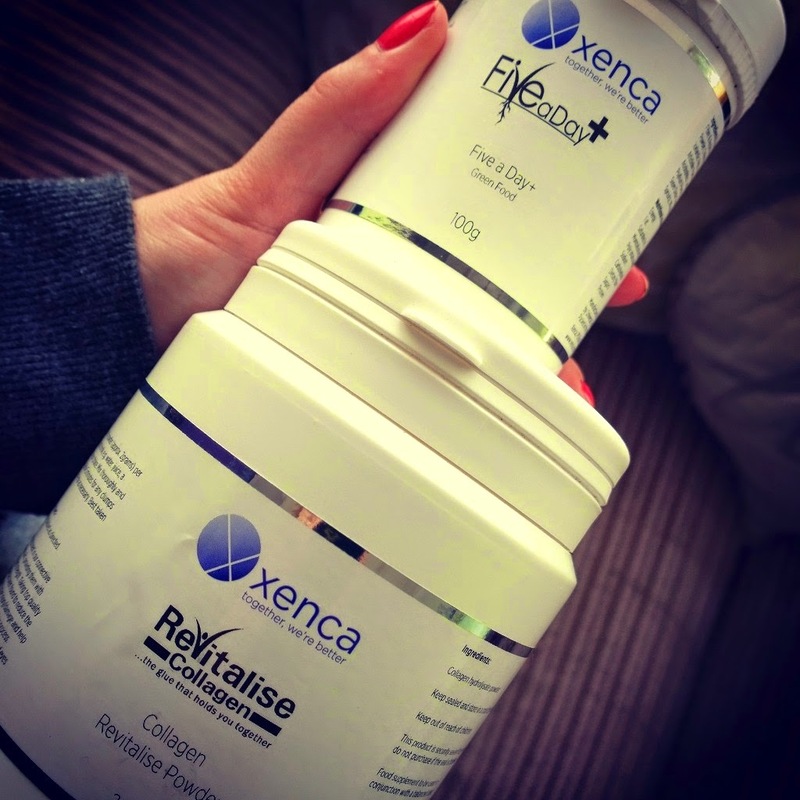 I've been reading a lot about collagen recently and was keen to find out more. Suzie advised that these supplements contain hydrolyzed collagen, the kind you want as your body can absorb it effectively, and again, we had the chance to try some. It didn't flavour the water at all but, convinced that it could give my skin a boost from the inside out, I picked up a tub to try. I'm a month away from my thirties so I'm putting these two supplements through their paces to see if they can help me look my best in four weeks - here's hoping! Again, everyone really enjoyed the talk and both Jo and Suzie were so friendly and felt part of the group, making for a relaxed but informative day. We didn't even realise it was 3pm already, and with trains and shopping trips scheduled, we said our thank you's and goodbyes. Apparently this pic was trending on Instagram at the weekend! 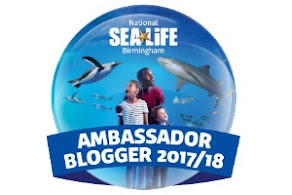 Emma and I really enjoyed organising the day and the bunch of bloggers we had pulled together were just great. It was so nice to talk about our common interest and to enjoy trying new products. Weleda and Xenca were great to have on board and I felt that we all took a lot away from the day - good friends and lots of ideas! Sorry you couldn't make it either, it was a really nice day and we hope to put on another one again - I'm sure we won't be able to resist! Cannot wait for part three. Thank so much for organising! You're very welcome! Thank you so much for coming, I'm sure a third one will be in the pipeline soon...!